Let's face it: going green would be a lot easier if we were able to know in the push of a button just which products were locally made, how to recycle all our trash, and where the closest farmer's market is located. Fortunately, through the magic of technology, the answers to these questions and more are now readily available at our fingertips through the creation of a plethora of new, innovative eco-friendly apps for smart phones. With over 1.5 million ways to recycle over 350 materials, this app makes recycling a breeze by using your current location to help identify a nearby solution to your recycling questions. The idea behind Locavore is simple: help the environment, shrink your carbon footprint, and reduce waste by locating good, local food. The app includes a list of local farmer’s markets, what’s in season in your city or town, and shares with social networks just what local snacks you’re devouring on any given day. A website-turned-app, this resource allows you to scan barcodes while shopping to ensure you are purchasing the most environmentally responsible, green products possible based on scientific ratings. Creating a “personal settings” filter also allows for users to find products that match their individual values. Don’t know what to do about all that junk mail? Snap photos of mail you no longer wish to receive and MailStop turns your iPhone into a tool for stopping it and, thus, reducing waste. The app submits an opt-out request with each company and track their responses for you in an online account. If you’re looking to achieve a new set of eco-friendly goals, Green Genie has a robust database of green tips, resources, terminology, external readings, projects, and more designed to help you get started in the right direction. The app also allows you to see how small changes made to your lifestyle add up to big environmental impacts. While carpooling has been around for ages, it can be difficult to link up with people nearby if you don’t already know the travel schedules of your neighbors. Carma lets users set up rideshares by matching them with nearby people, simultaneously helping the environment and building community. Ever wonder just how much energy it takes to power your home's heating, cooling, lighting, hot water, and appliances? iViro is here to clue you in to these once-mysterious issues, and also offer suggestions on upgrades and retrofits that will save energy and dollars. An online-media-outlet-turned-app, TreeHugger is committed to helping drive sustainability mainstream. This powerhouse of green news, reviews, and solutions aggregates up-to-the-minute content on the latest in eco-friendly happenings across the globe and places them conveniently in the palm of your hand. If you’re ready to challenge yourself to live a more eco-friendly day-to-day life, EcoChallenge is the spirit animal for which you’ve been searching. The app provides handy, detailed visuals to help explain the latest in current sustainability issues, and provides step-by-step tips for helping anyone go green. 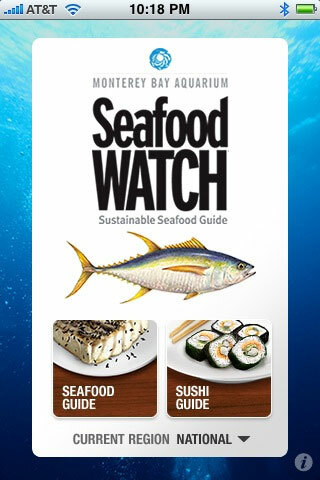 Going local takes on a whole new level of importance when it comes to seafood, and The Monterrey Bay Aquarium is committed to making local aquatic food selection as simple as possible using their GPS-aware app. Bonus: the latest feature helps users map, share, and keep track of all restaurants in their area serving sustainable options.